Tom Petty has been to the desert, I'm sure of it. Out in the great wide open. Our annual trip to the Great Wide Open was incredible. A few weeks since returning from the high desert and I'm still abuzz with the memories, sights and sounds. That's what happens when you go to the desert in early fall. The views are so brilliant this time of year. So much, in fact, that the mind cannot possibly process the beauty it's taking in. It's like looking at a person who is so striking, it hurts. Your eyes see features that your mind cannot possibly process, so it doesn't. (Plus it would take too long to stop and look at everything and your riding buddies would start throwing rocks). So you just pedal on, stealing flirtatious glances over deep precipices and across wide horizons, all the while trying hard not to miss any details. Or die. This, to me, is the essence of mountain biking. This year's adventure started out with a new twist. 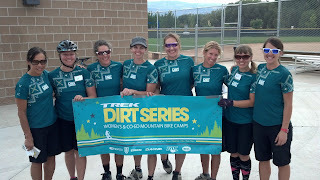 A few of us ladies, Carly Thompsen, aka Gnarly Carly and April "I'd rather be downhillin" Eyberg and myself lit out before the boys in time for the last Trek Dirt Series Camp in Fruita. Carly and I both did a camp earlier this summer at Winter Park. It was an eye opener for me and since we were going to be out there, I decided to do another one. It didn't take much convincing for Carly and April to sign up too. Sweet. We left right after work on a Thursday and rolled into Denver by 1am. A sweet hook up from April allowed us to sack out in style. By noon we were checking into our not-sweet-hook-up motel. Hey, they were bike friendly and that equivalent to 4 stars in my book. It was fortunately sandwiched between 2 liquor stores, a greasy spoon and a coffee shop. See? 4 stars! Plus free breakfast of eggo waffles, muffins, bagels, fruit, juice, etc. A funny thing happened after I checked in: as I was walking out of the little office, a woman entered with a bouquet of flowers. She said, "These are for Roxzanne Feagan". I turned around and I said, "That's me!" 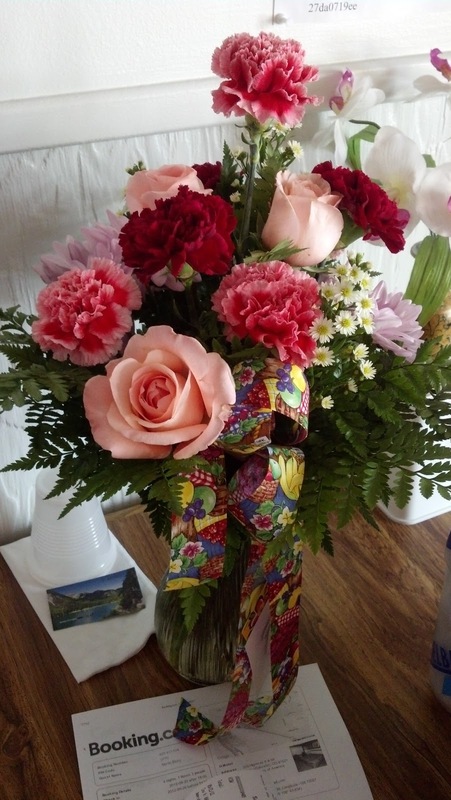 Ryan had sent me flowers as thanks for nursing him after he broke his collar bone. It was a wonderful surprise and earned points with the old German woman behind the counter. I eventually gave them to her when we left later in the week. Once we got settled into our room, we headed straight for 18 Road in Fruita. It's a good starting point for newbies who haven't ridden the area. It's not too technical nor strenuous. I had planned to take them down Kessle Run but took a wrong turn and ended up pretty far out from our car. Although I knew the fastest way to get to the trail was via a gravel road, I opted to go down a trail that I hadn't been on before. We hit a barrier fence and decided not to chance it. We went back to the road and hooked up with Kessel for the swoopy, whoopy ride back to the car. The girls were grinnin'. Good sign, I thought. We headed back to the motel, cleaned up and hit the local shop and then got some dinner at the local brewery. It always surprises me to go into a brewery type establishment in such a cool part of the country and find it covered wall to wall with big screen TVs showing every football game on the planet. But I guess the locals need a watering hole too. After dinner we drove up into the Colorado National Monument in hopes of catching the sun set. It was a great way to end a long day. Just us girls and the canyon. No bike talk. No tire talk. No wheel talk. 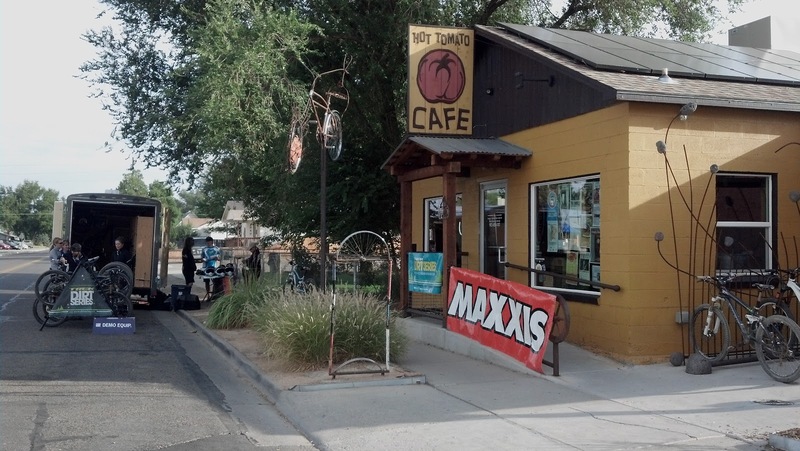 The camp began with registration at the famous Hot Tomato Cafe. Famous for the former pro racer owners and legendary photographer, Anne Keller. The vibe there was palpable, even though it was closed. We all knew we were at Trail Ripping Central, USA. After check in and getting assigned to our groups we headed out to a local ball complex where we utilized soccer fields for our skills and drills. It was my goal to launch myself off a jump and a drop before this camp was over. The first day was pretty basic, except I did manage to rip apart my der cage after I slid off of a teeter that I couldn't get to tot. Luckily it was only a small piece and somehow the chain managed to stayed on the rest of the day. It was a hot and sunny day. Lunch was sponsored by Hot Tomato so we all had our choice of pizza and salad. Once done with lunch it was time to head out into the Great Wide Open to test our newly learned skills on the heavenly terrain that is Fruita. Our group went to Mary's Loop. 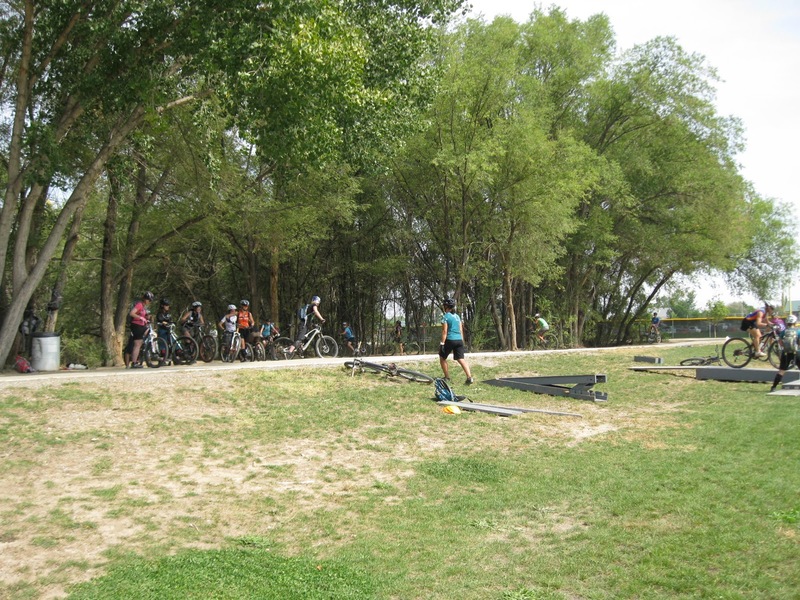 Rumor had it that the instructor had been able to teach new riders how to get down Horse Thief Bench only after one day of camp. I heard that when I was in Winter Park and we were with that instructor so I was amped. I've been coming out to this area for probably the last 8 years and never in my wildest dreams did I think I could ride down that rock fall. This day, damn if I wasn't gonna try. As a group we decided, instead of getting in miles, we'd stop and session areas that would tap our skills that we learned earlier that morning. The first was a 1' step up onto an incline. To most dudes this would seem like a no brainer but to us ladies, who lack the upper body to bulldoze such a feature, we need to do a few extra things to ensure that front tire gets up and over the edge. One of the most important skills I relearned (I already knew how to do but didn't know I knew it) was the front wheelie lift to get up and/or over obstacles. I think this move will be a revelation to every woman who rides. This move will help them become mountain bikers instead feeling like a weak girl who can't lift up her bike. Anyway, I got up and over the ledge without issue, on flat pedals and was met with cheers. Even the instructor was impressed. I was too since I'm new to flat pedals and had to use some extra body english just to make it work. Nobody else was able to do it so I felt a little rush of pride as we rode on. We finally made it to Horse Thief, a famous trail in the area. To get to the trail, however, there is a right of passage: getting down a cliff face that is precarious even on foot. Our instructor was amazing. She broke down the "trail" into sections and we sessioned each section until we could do it and then we'd move on. The first section was a series of four step downs that got progressively taller. It took me a couple tries to get past the 2nd & 3rd steps. The last step was about 2 ft tall with a line that pointed my tire directly into the side of the cliff face, with no clear transition. I couldn't wrap my mind around it enough to attempt it so I didn't. But that was ok. The next section had a high line and a low line. The high line had some step downs along the way while the low line, also with step downs, had a safe crevice, that didn't have quite the consequences to the left and right. That's the line I took. I did it on the first attempt. I looked up at what I had just ridden and couldn't believe it. Not that it was so easy but part of the puzzle of that descent had been solved and it didn't seem so daunting anymore. I could ride anything if I could ride that, I thought. The last section was pretty gnar. Her line required sorta sliding down a flat boulder into a crevice and onto a rather unwelcoming pile of boulders. I was satisfied watching our instructor nail it. It was liberating in some odd way. She made me believe it was possible. That has never happened to me on the bike. Watching dudes ride has never done that for me either. 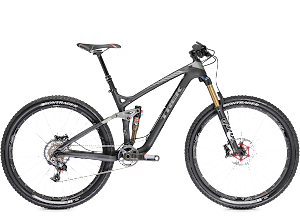 Just In that short session I felt like I had just plugged into the mountain biking matrix and suddenly had technical descending skills. 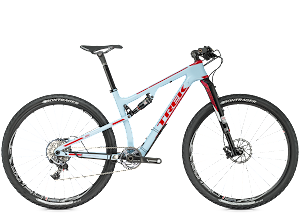 One caveat: I was riding my Trek Remedy that has 160m of travel and slack head angle and of course my seat was slammed to the frame. But I still had to believe I could do it and as they say, mental is half the battle. We did get to ride part of the Horse Thief but not much before we had to turn back and hike up the Bench and then ride down Mary's Loop to the truck. I knew I'd be back after camp. My hope was that this day wasn't just a fluke. See this video footage of awesome girl power to get an idea of the descent. After returning from the trail, we all met back at the Hot Tomato for some grub. The boys (Ryan and the Todds) had arrived earlier that day and were also at the Hot Tomato when we arrived. I couldn't wait to tell Ryan how I had ridden part of Horse Thief Bench! After a much-needed beer, us girls walked to Over the Edge bike shop, another iconic location in this little bike mecca, for bike tech sessions. There, patient mechanics answered our girly questions about suspension, drive train and breaks. They broke down each area to help us better understand the inner workings of our rigs. I took the suspension class, learning a bunch about all the adjustability my Remedy has. Later that night, after word that Martin was delayed, we all hung out outside the motel. Fueled by tequila, whisky and electrolytes, we were a bit loud. After some sneers from other motel guests, we moved our party to the picnic table on the other side of the lawn in front of the motel. Eventually other riders arrived and joined the party. Nobody is a stranger when ya ride out there. Our view from the motel. 4star! Carly and April intently listening to yet another bike geek session. Todd taking over bike repair duties on this trip. Day 2 of dirt camp was my day of redemption. The morning started off way awesome. The owners of Hot Tomato made an appearance welcoming all of us campers and then giving away prizes. 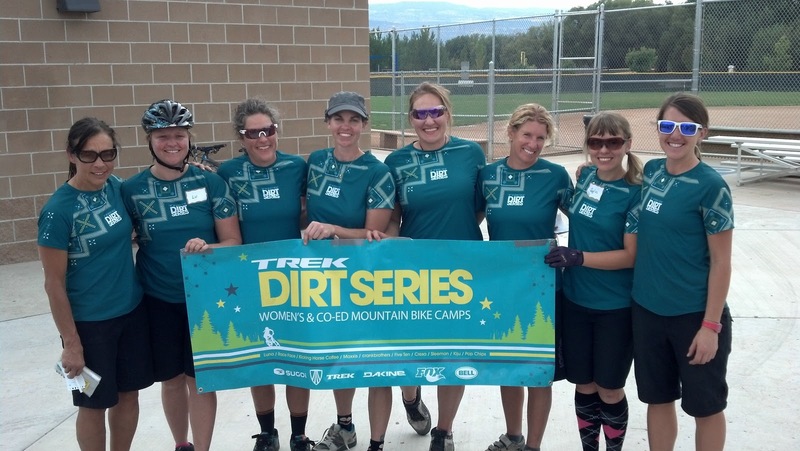 Just knowing these two ladies are at the epicenter of mountain biking in the west is inspiring. April won a prize in the raffle of discounted gear from Sugoi. Everyone got some swag: a tshirt or a hat or a notebook plus a canister of Kicking Horse coffee beans. Couldn't have been happier. For the second day of camp, we were given the opportunity to choose which advanced skill classes we wanted to take. I chose drops and jumps. I didn't choose them at Winter Park and wish I would have. I was very nervous because I didn't know if I had my form and timing down enough to not totally biff over the edge of the ramp they had set up. But true to form, the instructor broke down the move so simply that I wanted to smack my forehead. It still took a few runs until I was smooth but I made it through the sessions without falling on my face. I was dreading the jumping part. I really sucked at it at Winter Park but I left that day feeling like, with more practice, I could get it down. Timing is key. That afternoon was spent at 18 Road riding PBR, a new trail that has some jumps and kickers. Our instructor was a hellian on the trail and was really smooth. Our sweeper was none other than Ann Keller! Woah! Nerve racking. Plus she was taking pictures so that was even worse but so fun and cool to shred with these chics! And to my surprise, the Todds and Martin went riding by when we were on a break so it was fun to give high-fives to the boys. After a few runs, I think we were all pooped. It was the last camp for the instructors and it was party time! After camp was over, we all met up and hung out at the motel. We got to catch up with Martin who was jet lagged to the max but had already put in a few hours on the bike despite still being on Euro time. But that's what ya do when you're in the land of single track and it's daylight. And you have some of the greatest riding buds anyone could ask for. And beer. 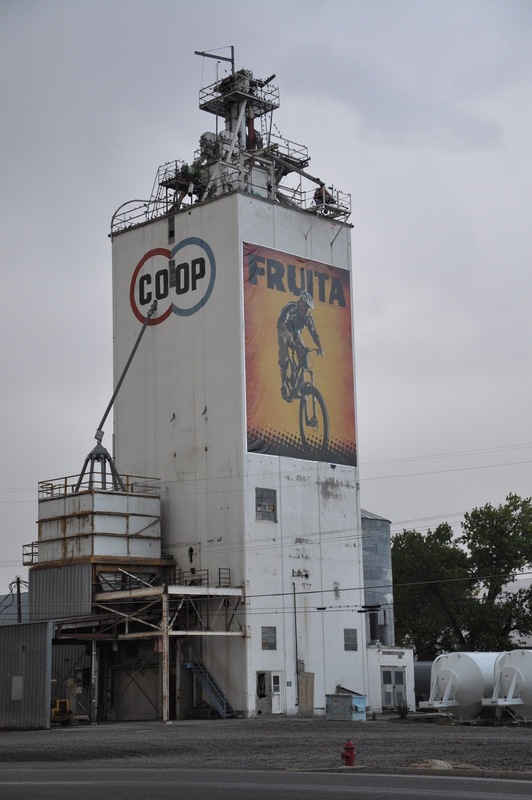 PART 2: FRUITA UNPLUGGED: THE RIBBON, MARY'S LOOP, HORSE THEIF FOR REAL AND RAIN. Still lovin' your writeups, Roxy. It's almost like I just did all that stuff, too. Thanks!